Scotland's hopes of a medal at the World Wheelchair Curling Championships are at an end after a 7-5 play-off defeat to hosts Russia. The Scots, led by skip Aileen Neilson, had looked set to finish out of the top four, but a dramatic win over the USA gave them a lifeline. But they were unable to get past the Russians and finished sixth. 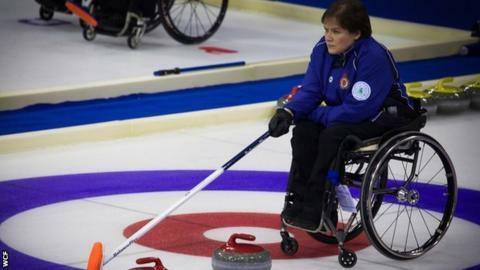 The Scots will form the basis of the GB wheelchair curling team at next year's Winter Paralympics. The team of Neilson, Tom Killin, Gregor Ewan and Rob McPherson and alternative Gill Keith had made a solid start to the competition, which was the first to be held in the new Ice Cube Curling Centre in Sochi, which will host next year's Winter Olympic and Paralympic curling events, winning three of their first five matches against Finland, Korea and Norway. But they were beaten 6-4 by China, and the Russian defeat - where they lost the eighth and final end 1-0 - coupled with a 5-2 loss to Slovakia, looked to have ended their medal hopes. However, they put in a strong performance against the USA, rallying from 4-3 down after five ends to win 7-5 and earn a play-off place for the fourth and final semi-final spot. In the play-off against the Russians, things were as tight as the first encounter but Russia scored three in the sixth end to go 7-3 ahead and the Scots were unable to respond. "Our technical performance has been a significant improvement on where we were last year, but we still have work to do on the tactical side and maximising opportunities when they arise," coach Tony Zummack told BBC Sport. "On paper the results from this year are not what we wanted, but we have improved technically and when we look at the statistics, as a team we are right up there amongst the medal challengers. "When we played the medal challengers this week we ran them close, so if we keep up the rate of improvement we should be able to challenge for medals next year. "We are on the right track, but the rest of the world is also improving fast, so we need to keep working hard and focusing on the processes that will improve our performances further."